Dutch philologist; born at Amsterdam May 16, 1851; entered the Athenæum (now the University) there in 1867 and studied classic philology. An accident at gymnastics aggravated for two years the deafness from which he had suffered since his boyhood and caused him to give up his regular studies. Mendes established himself as a private master of classical languages and soon became known for his pedagogical capacity. Since 1891 he has been curator of manuscripts in the University library. Mendes has applied himself to the study of Greek, especially of Homer. In collaboration with his friend Dr. van Leeuwen (since 1884 professor at Leyden) he published the so-called "Editio Batavorum" of Homer ("Ilias," 2 vols., Leyden, 1887-89; 2d ed. 1895-96; "Odyssea," 2 vols., 1890-92; 2d ed. 1897-1898). In this edition not only has the letter "digamma" been restored at the beginning of words in which the study of comparative grammar proves it to have been originally pronounced, but even the greater part of the results of the latest researches in Homeric grammar have been applied in reconstructing the text. For the use of Dutch schools the same collaborators published: "Attische Vormleer" (ib. 1877; 6th ed. 1901), an Attic grammar, and "Taaleigen der Homerische Gedichten" (ib. 1883; 4th ed. 1898; translated into German 1886, and into French 1887), a grammar of the Homeric idiom. Mendes himself wrote a Latin grammar (ib. 1885; 4th ed. 1899). On Jan. 8, 1898, Mendes was nominated "doctor honoris causa" of Amsterdam University in recognition of his services in classical philology. As curator he published a catalogue of manuscripts, "De Handschriften der Stedelijke Bibliotheek met de Latere Aanwinsten" (ib. 1902). From his youth Mendes has always had a great admiration for the stage. He is the author of many translations for the Dutch theater, and of some original comedies and plays, e.g. : "De Schuld" (1882); "Gravin Sarah" (1883); "Tehuis Gebleven" (1883; 2d ed. 1892); "Zyn Model" (1888). His own reminiscences of the stage he collected in a volume entitled "Tooneelherinneringen" (ib. 1900), containing important materials for the history of the Dutch stage during the second part of the nineteenth century. 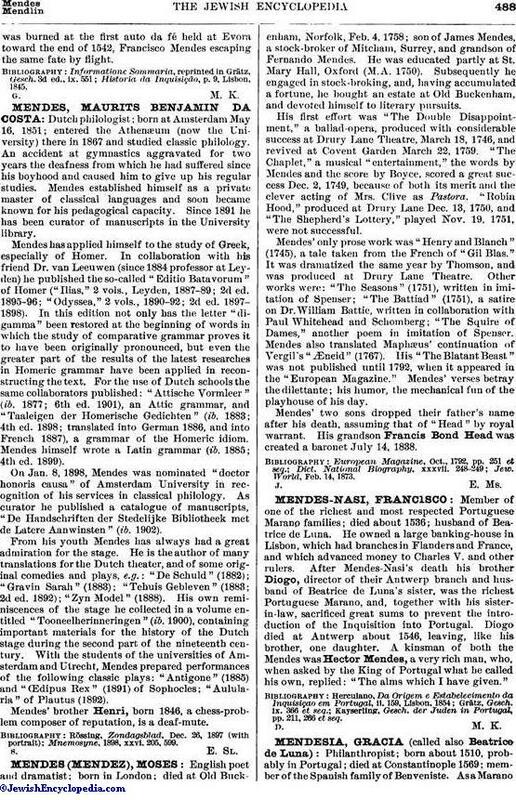 With the students of the universities of Amsterdam and Utrecht, Mendes prepared performances of the following classic plays: "Antigone" (1885) and "Œdipus Rex" (1891) of Sophocles; "Aulularia" of Plautus (1892). Mendes' brother Henri, born 1846, a chess-problem composer of reputation, is a deaf-mute. Mnemosyne, 1898, xxvi. 205, 599.